You’d think by now we would all have the retail discount cycles memorized, but even I have to check my notes on this. There is this unspoken agreement among retailers to have the same sort of things on sale or clearance at the same time. 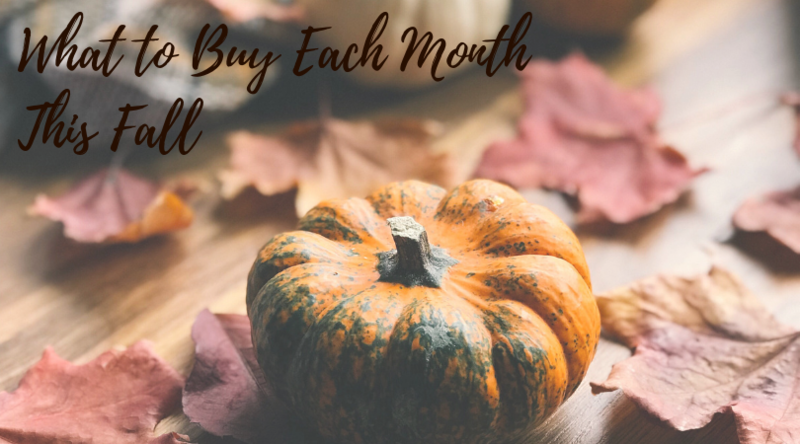 It’s up to us to keep track so our money goes farther and to know what to skip buying each month. Today I’ll cover September, October, and November. It’s a busy month with summer ending, school starting, and football season beginning. Whenever a season ends there are great deals on seasonal merchandise. Look for deep discounts on summer clothes, camping gear, air conditioners & fans, and grills. As the month progresses, the prices will get lower, so if you aren’t eyeing a specific item, it pays to wait. Mattresses are always a good deal this month. I figure it’s because it is far enough out from the holiday season to be able to spend, yet close enough to think of new guest beds. While you are at it, bedding is also discounted this month. Have any travel plans in the next few months? Airfare is traditionally a good deal in September, so go ahead and book your tickets. The new models from car manufacturers are about to be introduced, so the current stock needs to go. Same with iPhones, the new model will be announced next week, so the older ones will be discounted. Don’t bother with a new TV, they will be on sale later in the year. I always feel like October is really the start of fall with corn mazes in many places, pumpkin patches, and Halloween coming up. Now is the time to buy costumes. They should still be in good supply at the beginning of the month and starting to go on sale. If you have little ones with their heart set on a specific costume, don’t wait too long. Small appliances like slow cookers and coffee makers will be on sale in October, a great time to replace yours or buy as gifts. In keeping with the kitchen theme, cookware will also be on sale in October. Athletic footwear is usually on sale in October, just in time for better running weather here where I am. Like cars and electronics, athletic shoes get new models, so the old ones get marked down. As far as food, baking supplies will start going on sale in late October starting with pie ingredients. Stock up on canned pumpkin and evaporated milk now for seasonal baking later. Hold off on electronics, they will be on sale closer to the holidays. This is a big sale month with Veteran’s Day (I know that’s not really the point of the day!) and Black Friday. Many retailers offer a special discount with a military ID, I’ll post a list on Facebook closer to the date. For now, I’ll just say that early fall fashions will be on clearance already so it’s time to start buying flannel shirts and lightweight sweaters. Black Friday shopping has turned into a sporting event it seems. There are many websites with pages dedicated to the sales as information is leaked from major retailers. Look for electronics, TVs, and computers to be heavily discounted that day. During the rest of the month, vacuum cleaners, wedding dresses, and cold & flu supplies will be on sale. It’s a great time to stock up on decongestants and tissues for the inevitable colds that are coming. Don’t forget to grab some half-price Halloween candy on November 1st! The mini candy bars are great filler for Christmas stockings if you can keep them around that long. Billcutterz is here all year round to help you get the very best deals on your monthly bills. There is no need to wait, take a few minutes to sign up and submit your bills. Then our team of Savings Experts can go to work for you, so you can relax and plan some shopping with your extra money.